Terry and I decided to go up to Mt. Adams to hang out last Saturday night. Despite living a mere mile or so away, we just never head up there, as much as we like it. We had a pretty fun evening, starting out at The Monk's Cove, where Terry had his first Jello shots. He'd never had them before, can you believe it? I felt sort of like I was back in college again, though I only had one or two. They weren't very strong. Mt. Adams Fish House is owned by the same people who own Teak, who are the same people who own Apsara. Terry and I, in the fall, had actual entrees (not just sushi) at the Fish House, but we don't really recommend it. I found the entrees uninteresting and really oversauced to the point where you couldn't tell what sort of fish you were eating. And why get entrees when you can have sushi? Their sushi is quite good. It's very fresh and they always have some pretty innovative specials which are all beautifully presented. We started out with some edamame, which I did not take a picture of. Bad blogger. We then ordered our sushi-- two rolls and some nigiri. 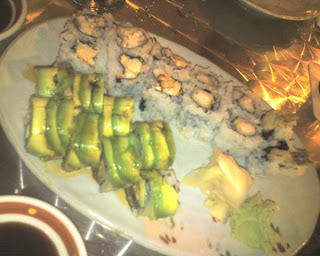 The rolls we chose were the Baltimore roll (which involves Old Bay seasoning, cream cheese, crab, avocado and cucumber; a bit like a Philadelphia roll) and the spider roll, which involved fried soft shell crab, spicy mayo, cucumber and avocado. It was quite tasty (but Terry ate the ones with the legs). We also got unagi, smoked salmon and tuna. I'm a huge fan of unagi-- but often, it's too covered in the soy and sugar sauce, and you can't taste the eel. When the sauce is right, the unagi itself is often chewy. This wasn't as tender and soft as I've had other places, but it wasn't too overly sweet or salty, and not too chewy. It is not my favorite sushi in town (Sake Bomb is my favorite, and Aoi was better, but that's for another review after a more extensive tasting) but it is a great choice when you're up in Mt. Adams. Last week's theme was grilling out. Chef Chris made "sliders" (those are so fashionable now, aren't they?) as well as portabella burgers (for the vegetarians), some pasta salad and brought along a few pies. It was beautiful out on the deck of the McAlpin! Cincy Chic will be back at the McAlpin tonight for their final installment of this series of Cincy Chic Chic Chefs-- desserts! They'll also be giving away two Cincy Chic aprons, modeled here by Amy Storer and Susie Moushey. Come on out, get some yummy desserts, and check back at the end of July for the next installment of Cincy Chic Chic Chefs, which I hear is going to be at EQ at the Party Source. Stay tuned! So, after the minor comment war after I panned Balboa's at Taste of Cincinnati, Terry and I decided that we had to try Balboa's in the restaurant, under their normal conditions. We decided, actually, to do it twice-- once during the day, and once during their special evening hours. The first time, Terry went during the day. He got what he would normally order in Philadelphia (he spent the better part of several summers in Philadelphia a few years ago). He got a cheeseteak with provolone and tomato sauce (he corrects me: "Steak, provolone, sauce, fried onions." Okay, then.). It was towards the end of lunchtime, with no wait. It was, in his words, "Okay, at best". He commented that the bread was still a little stale. The trouble might be getting the Amoroso's rolls here-- if they're baked in Philadelphia, they're a day old at best. If the dough has been frozen, that might compromise the quality as well. There was something off a bit about the meat-- we can't quite figure out what's wrong, though we have our (unprovable) theory. He left me half the sandwich, which greeted me on my kitchen counter when I got home from work that day (accompanied by a voice mail hoping that the cats didn't get to it). I took a couple of bites-- it wasn't bad cold, but not anything to write home about. I don't think I finished it. A couple of weekends ago, we found ourselves out late on a Saturday night and determined that it was the perfect time for both of us to try one fresh, together. The line was enormous-- we waited for 45 minutes. Several people actually left while we were there because the wait was so long. Problem? Not nearly enough ovens for the pizza. The guy behind the counter said that they weren't used to this many people. Most people were ordering the pizza, which were made individually and by hand to order. I think that perhaps there is a way to roll out the crust in advance-- this is what took most of the time. Since the pizza was so labor-intensive, there were fewer people working the sandwich line than there might have been. We-- or really, Terry, as I was instructed to grab a table to spare my feet from standing forever-- ordered two cheesesteaks, prepared the same way as he ordered a week or two before. I may need to try the pizza, because even fresh, these really weren't worth the wait. The beef was bland, the sauce had a distinct tinned taste, and the bread was again a little stale. Terry is a bit more positive about them than I am, but I just don't get it. I would, however, like to try the pizza-- they looked cheesy and delicious. The next time we find ourselves out that late, we'll try the pizza. Regulating dining out-- what do you think? It's not news that NYC has some of the most progressive (or, depending on how you look at it, regressive) food service laws in the US. They were among the first to ban trans fat, and now they mandate that chain restaurants include nutritional information on their menus. I do indulge in the occasional chain restaurant, and am appalled at the nutritional information I have found. Chipotle is a pretty bad one-- their food is purported to be healthy (lots of veggies, no antibiotics in their chicken, the only thing that is fried are the chips) and compared to, say, McDonalds, it is (though McDonalds can be applauded for adding fairly healthful salads to their menu, as well as adding fruit to the choices for their Happy Meals. I'm not saying a standing ovation, but golf claps will certainly do)-- however, I discovered the Chipotle Fan website, which has a nutritional calculator. Oof. Scary. I usually ("usually" translates to twice in a year) get a salad -- for me, substandard tortillas aren't worth the calories-- and the salad, though heavy with veggies, is still about 885 calories. Let's not talk about the sodium, which is atrocious, and the fat, most of which comes from the salad dressing. There is no reduced calorie or low fat option. If I made the same salad at home-- with a fresh vinaigrette, marinated grilled chicken, and homemade (or perhaps store-bought from someplace like Trader Joe's or Fresh Market or Madison's) fresh salsa, I know I could cut the calories in half. I think that's the problem-- most people in America now don't know how to or desire to cook and don't know what actually is involved in the ingredients of food. All of that salt, fat, and any artificial stuff that might land in there doesn't NEED to be there, but the mass production of chain restaurants needs salt and artificial stuff for preservatives and to match the palate of the average American, which is generally oversalted. For me, banning might not be the road to go down (I have a libertarian streak, I guess), but education is. At a chain restaurant, where everything is standardized, there is no excuse for not having nutritional information on a website. A book I picked up recently,Eat This Not That: Thousands of Simple Food Swaps That Can Save You 10, 20, 30 Pounds-or More! , has healthful choices vs. really horrible choices at various chain restaurants. Outback, for example, argues that its meals are so "fresh" that they can't quantify nutritional content-- probably because they have an appetizer that has 2900 calories. Ouch. I would never, ever expect a non-corporate restaurant to have the resources to provide nutritional information, but a restaurant that develops their food in a corporate test kitchen has no excuse. Do you make choices at restaurants based on health or caloric content? I'll admit that lately I haven't, but when I lost a bunch of weight in 2006, it's all I did and found places like Panera, that had nutritional information online, a godsend. Counting calories can be a bear, but for many it works and at the very least allows the diner to go in knowing what they're in for. So what do we need? Calorie counts? A more educated public? I'd argue for both-- not on the menu, per se, but at least available on websites. As Americans, our perception of portions has become distorted ("value" = "big portions"), but we've also got a major collective fear of fat (both in foods and on our waistlines) which leads to some nutritional schizophrenia. What are your thoughts? ...I'm still working on a template I like. This one may just stick for now, considering that Blogger likes to eat sidebars. Yuck. Meanwhile, I'm working on reviews of Cincy Chic Chic Chef (last one in the series is this coming Wednesday! ), Kellogg's Country Kitchen, Mt. Adams Fish House and a lovely dinner Terry made for me this week, so don't think I've stopped eating. I probably SHOULD, but I haven't. Lolcats do rule the world, don't they? Anyhow, you can now reach my blog via http://winemedinemecincinnati.com The RSS feed has not and will not change-- I just wanted an easier way to tell people how to find my blog if I didn't have a card on me. I'm going to do a bit of housekeeping and make a few improvements over the weekend. Stay tuned! I mentioned that I had bought some Just Cured salmon last week-- great, subtle flavors and it's local! Val over at Cincinnati Locavore did a great post on his process. Go and check it out, and check him out at Findlay Market this weekend! I call this a mini-review only because a) I've only sampled one dish and b) twice now, I've eaten my meal without taking a picture. Bad blogger! Chan's Asian Wok is next door to Half Price Books in Mason, near my office. I wandered in there one day when I left my lunch at home and had an inkling to grab a quick sandwich at Subway. Chan's was between Half Price Books and Subway, and it smelled really good, so I went in. Wow. For $4.50 I got some of the best take-out, "Americanized" Chinese I've had in a long time. I got the chicken teriyaki with steamed rice and veggies, which had a bunch of not too sweet, not overly salty sauce over bits of chicken breast and crisp-tender vegetables. According to their menu, everything is fresh, nothing frozen and they try to cook healthfully. It's incredibly obvious-- this is not your usual, sickeningly-sweet, overly salty, nearly-unidentifiable dark meat, but some really high quality stuff. I stopped in there today and got the same thing-- again, it was quick, fresh and delicious. I also saw a huge new banner-- apparently they were just voted to the Top 100 Chinese Takeout Restaurants in the country! Pretty nifty. If you're in the Mason area, check them out. Okay, okay, anyone who knows me knows that I'm sort of sports-stupid. I really like watching baseball, but every game Terry and I go to, he ends up spending half the game explaining things to me. I know TJ Houshmanzadeh, Carson Palmer, and Chad Johnson by sight; everyone else is just a big guy in a jersey. I know more about football than I used to, thanks to Terry and our friends Tracy and Ron, who have all at some point or another explained things while we watched a game. My lack of football knowledge stuns my mother, who is a huge Bengals fan, and who had season tickets while I was growing up. She's also still despondent that I don't know how to swim, despite several summers of swim lessons. It just goes to show you that just because you expose me to something, it doesn't mean it will stick. My lovely blogger-buddy Shannan emailed me a few days before the Taste of NFL event to see if I wanted to go-- 30 chefs? Sure! Good cause? Even better! The event was a blast-- lots of Bengals players around to sign autographs, several of them pouring shots of vodka for anyone who wanted one, some really cool auction prizes, and all of it benefited the Freestore/Foodbank, which is so important, particularly in a time of economic downturn. I read somewhere that demand on food banks are doubling and even tripling, so having a huge organization like the NFL raise money and give money to food-related charities is so important. Another great sign? Many of the executive chefs were serving food behind their tables. I chatted with Chef Travis Maier from Seny, spotted Jean-Robert de Cavel slinging French Castles behind his station, Chef Paul Sturkey was at Mesh's station-- everyone brought their A-game to this event, and it showed. I don't think I tried all 30 dishes, so I'm just going to highlight a few of my favorites. Julie's favorite dish of the night: mesh's pork belly with sweet potato mash. The pork belly was braised in cider, the sweet potato mash wasn't too sweet or too overspiced, as sweet potato mash can be. It was not the perfect summer dish, for sure, but it was perfect for fall and football (pigskin? get it?). Terry's favorite dish of the night: The Palace Restaurant's Croquette of Wild Mushroom and Oxtail with Port Wine Reduction. Crispy outside, rich inside, melt-in-your-mouth good. He went back for a second one, which we didn't do for any other dish. I really couldn't wait to try this, as I knew it would be something interesting. It was a fun twist on steak and potatoes-- a piece of rare strip steak topped with potato skin "caviar", with a side of pickled potato and avocado puree. It was presented to emulate sushi. Very pretty and quite tasty. I talked to Chef Travis and asked what people thought of the dish-- he said people loved it once he explained it, and he really wanted people to ask questions so he could educate. Awesome! This one was really good-- loved the emulsion, loved the amazingly light-tasting pork belly-- but was thrown off a little by the chunk of slightly underripe watermelon. Still, the tuna/pork "surf and turf" was delicious. I didn't try the ribs, but I did try the chicken. Lovely, sticky sauce-- very maple-y. I'd like to try this at home, actually, as it seemed simple and had that air of home-cooking. Cincinnati Cooks is itself a program of the Freestore/Foodbank. It is a job training program, and graduates of the courses are hired by local companies, and the food they use to cook and cater is all donated. The catering brings in revenue, which allows the training program to flourish. Fantastic! Their catering menu looks really good, too; I will keep it in mind for my next catered event. Check them out here. My only complaint (if I can call it that) is that it was elbow-to-elbow, making it a little hard to eat at times, but such is the nature of an event like this. It was a great time, for both foodie and football fan. This is the kind of event where someone could take a spouse or friend who wasn't a huge football fan and they would still have a great time. I hope to check it out again next year, but in the meantime, I need to get to the Palace restaurant-- Terry wants some more croquettes! Terry and I love minor league baseball. We used to have Dayton Dragons seasons (well, part of a season pack), and we occasionally go to Florence Freedom games. They're fun-- you don't really watch the baseball, you watch all of the silly stuff that goes on between innings. And compared to GABP? The food is fantastic. The Dayton Dragons' food is a home run (did I really just say that?) -- awesome hot dogs, sausages with sauteed peppers and onions, really good nachos, microbrews, the works. Florence Freedom food isn't too bad, either. I've had several things that were decent there: grilled hamburgers (a little dry, but tons of condiments), fries (really good! ), saratoga chips and chicken fingers (actual chicken tenderloins; a bit dry but A for effort). Plus, it's a lot less expensive than GABP (great for familieis with kids), and they have days where beer is $1. If you have the opportunity, check out the minors-- you can see up-and-coming baseball stars AND get a pretty good food experience. The first Cincinnati EATS appeared to be a great success-- a ton of people, all happily munching on Chef Joanne Drilling's food at Lavomatic. Our friends Ted and Tracy joined us, where we met up with Vudutu and his lovely significant other Donna as well as Jean-François Flechet (the Taste From Belgium guy). We were a darn lively table. A couple of issues-- I don't think Lavo is quite set up for this many people all eating at once, but it was a pretty good try. The menu was chilled cucumber dill soup, chicken, and a pavlova. The chilled cucumber soup was creamy, with plenty of dill. It wasn't low fat by any means-- I could taste the heavy cream-- but it was perfect for the steamy day we had last Tuesday. This was my favorite part of the meal, but I am very partial to chilled soups. We're going to pretend that picture is in focus, okay? The chicken was a great idea-- lots of zucchini, roasted tomatoes, and garlic-- but the final product was not so great. It was a bit dry and needed some more sauce for both flavor and moisture. This was where you really noticed that the kitchen wasn't used to turning out 100 chicken breasts at the same time. It was obviously high quality chicken, but even really good chicken won't hold up well to overcooking. Definitely an A for effort, and I expect that if I tried this on a regular evening, it would be fine. And now we have one of my favorite desserts that, sadly, won't be available much longer: pistachio pavlova with strawberries and citrus curd. The curd was perfectly sweet, yet tart, and the pistachio meringue was crispy and just a tiny bit chewy-- probably from the humidity. Meringue doesn't do very well with humidity, thus we won't see this on Lavomatic's menu until next spring. The salty-sweet combination is always a favorite in my book. In all, I really can't wait to see what Cincinnati EATS comes up with for their next get-together. For $36, this really can't be beat. Congrats to Boca, The Celestial, Daveed's, Orchids, Jean-Robert at Pigall's and The Palace for winning AAA's 4-Diamond award. The Palace has been winning it for 20 consecutive years. This is AAA's highest designation; we have no 5-Diamond restaurants or hotels in Ohio. Remember when we used to wait to see if the Maisonette would get its Mobil stars? Sigh. Cincy Chic Chic Chefs is in its fourth week-- only two more before they change locations to EQ at The Party Source in Newport. Last night, Chef Chris (who just turned 21, and is now a certified culinarian, the first step for American Culinary Federation certification, congrats, Chris!) made sushi for us. He explained what sushi is (sushi is the rice, not the fish) and made several rolls, with the audience's help. It was definitely fun, and took the mystery out of sushi for many of the women (and a couple of men!) in the audience. You can find the recipes, podcast, and video on CincyChic, presented by Screaming Bob! It was also Amy Storer's birthday-- we celebrated with chocolate cake and pink champagne. Later, a couple of us went out to Aoi-- I won't do a full review of Aoi because I only sampled a couple of rolls and because I didn't have my camera (though Amy was kind enough to snap a picture)-- but I can't wait to go back. The rolls we shared were awesome! Another fun night with Cincy Chic-- when are you going to join us? I was going to come up with some ridiculous pun on Seny's name (pronounced "sehn") but at 4 PM on a Tuesday, it's pretty lost on me. I'll let my readers (or The Boyfriend) fill in on that one. It would be a "Seny" to skip this restaurant? That might work. For some reason, Terry and I wanted tapas on Saturday night. I wanted something that could potentially be light, and we definitely wanted to try something new. We looked at Relish in Mason, but their menu looked less like tapas and more like entrees, so we decided on Seny. Seny, in case you didn't know, is owned by the Maier family of Frisch's Big Boy fame. Don't worry-- no tartar sauce and fish sandwiches here. Their son, Travis, went to culinary school and apprenticed in Spain, then came back here and opened a restaurant. There has been a bit of controversy, mostly because Travis Maier isn't as experienced on paper as some of his chef-owner counterparts in the city, and I had heard some mixed reviews. Instead of heeding the gossip, we decided to dive in. First, the service: it was laid back and knowledgable. The waiter was incredibly well-versed and enthusiastic-- and became moreso as I demonstrated that I was excited about the food as well. He explained that the dishes didn't come out in any particular order, so we ordered what we liked and noshed until we were full. He understood the nuances of the food. For example, the kitchen had forgotten rosemary oil for one of the dishes, he noticed, and brought some out so we'd have the full experience of the dish. The meal itself was a great deal-- five generous dishes, two drinks apiece, $65 + tip. One of Terry's beers, however, was taken off the tab-- it was half foam, being from a newly tapped keg. We were never rushed-- a good thing because it was far too fun to linger, people-watch, take in the scenery, and listen to the live Spanish guitar. There were two menus: tapas modernas and tapas tradicionales, as well as a daily special list. We ordered mainly from the tapas tradicionales list, as well as the scallops from the tapas modernas. Patatas bravas: smoldering hot potatoes, fried and covered with mayonnaise. What's not to like? The mayonnaise is heavy on the paprika, which made it smoky and lovely, and the potatoes were crisp on the outside and soft on the inside. Very filling. White gazpacho: this was the most surprising yet delightful dish of the evening. A soup, made traditionally-- almonds, garlic, breadcrumbs, olive oil and grape puree. At the bottom? Sliced grapes. This was sweet, cool. refreshing, garlicky-- all at the same time. I've found a recipe for it and I'm going to have to make it this summer. I think I prefer it to the more well known tomato based gazpacho. Charcuterie: Chorizo, Serrano ham, house-cured pork loin and salami with a couple of gherkins and two caper fruits. My favorite was the house-cured pork loin, which was salty and a little less rich than the chorizo and salami. Of course, if rich is what you're after, the salami is a great bet-- well marbled and certainly not the stuff of salami sandwiches in your Cincinnati childhood (maybe if you were a child in Europe!). Scallops: This is about the time the lights went down, thus the change in photo quality. Boo! Perfectly cooked, paired with bacon, crimini mushrooms and watercress in a light saffron cream. The waiter came by to put on the rosemary oil, which complimented it nicely-- I love the combination of woody, smoky and sweet-- and encouraged us to soak up the cream with the bread on the table. Yum, yum, yum. Concord grape gelee-- not your mama's grape jelly, this was slightly sweet and a little richer than the Welch's variety you're used to. You got a bite of it in just about every bite of the rest of the dish. Blackberry spheres-- not heavy on the blackberry, indeed, a bit lighter and less jammy than I was expecting. Grape caviar-- green grapes processed into a caviar-like "puree". Vanilla char-- the dish was brought out with a bit of still-smoking vanilla bean, which is an amazing scent. Chanterelle mushrooms-- for the woodsy quality in the wine. Very different. The entire plate was surrounded by a bit of rosewater foam and watercress. The entire dish was an experience, and after taking a bite, then taking a sip of the wine, each element the chef was highlighting was apparent. It was beautifully done, and one of the more impressive dishes I've seen in Cincinnati. Price? $11. Not bad, really. In all? I am so impressed and excited by this place-- it's just what Cincinnati needs. A bit of comfortable food, a bit of cutting edge stuff, a lot of attitude, a lot of ego, but some family roots. I will definitely go back again-- and I look forward to doing so. I'm telling you, Cincinnati is just hopping with food-related events this week-- and most of them benefit charity as well. First is HOMEARAMA Cooks for a Cause, part of 7 Days for SIDS. Visit HOMEARAMA (which is at Long Cove in Mason-- I drive past there every day and the homes are amazing, if opulent) on Wednesday, June 11 where you can sample creations from several local restaurants, including Andy’s Mediterranean Grill, Chalk Food and Wine, Brown Dog Café, Daveed’s at 934, HUGO Restaurant and Lounge, Jags Steak and Seafood, Jean-Robert at Pigall’s, Mesh, Polo Grille and Red Restaurant. All of the demonstrations occur in the kitchens of the homes between 6-9 PM. The demonstrations are included with your $12 admission (part of which benefits 7 Days for SIDS on Wednesday only), but you can pay an extra $20 for a VIP reception that includes food from Whole Foods from 9-10 PM at the clubhouse. The next event is on Friday, June 13-- Taste of NFL. This one benefits the Freestore Foodbank and features 30+ chefs/restaurants and current and former Cincinnati Bengals. It's at Paul Brown Stadium from 6:30-9:30 PM, and admission is $100, which includes dinner by-the-bite, a silent auction, a live auction for dinners with players and coaches, and a raffle featuring 20 Nights Out-- 20 $100 gift certificates to various local restaurants. Whew! The list of chefs/restaurants and their featured dishes is breathtaking-- I'm looking forward to trying Cincinnati Cooks! maple chicken and ribs, mesh's braised pork belly and Seny's steak and potatoes. Registration is required. Tickets can be reserved by calling Jennifer at 482-7539 This one's a great night and a fantastic cause. See you there! I don't generally get political in this blog, but I have to admit that it is kind of cool that on Saturday afternoon, I had the perfect, post-partied-too-hard meal from a guy who may just have catered for the next President of the United States. After our night out with friends at Mr. Pitiful's, Hotel Plays, Tavern on the Hill, and back to my place for more socializing, the perfect meal had to be a burger. Terry requested Ollie's Trolley, so that's where we went. Ollie's Trolley is hard to miss-- it's on Central Parkway in the West End, and it's a red trolley surrounded by pictures of local and national African-American leaders: Mayor Mallory, Martin Luther King Jr., Ken Lawson and Judge Leslie Isaiah Gaines. More prominently, on top of the trolley, are two huge photographs of the trolley's owner, Marvin Smith, with both Barack and Michelle Obama. He's been catering Obama fundraisers around town for some time. Besides catering, his food is take-out only, but there are chairs and tables outside if you can grab one. I had no idea that Ollie's was a chain, did you? I did some Googling in preparation for this post, and found out that Ollie's (and the Ollieburger) is a super small but national chain. I mentioned to Terry that there was one in Washington, DC, and he thought it sounded familiar-- he'd walked by it many times! According to an article I found based in Louisville, in the 70s there were a zillion of them, but they never really took off. There are now some locations in Louisville, the one in Cincinnati, and and a couple in DC. Apparently the ones in Louisville stay close to their burger roots, and the one in DC apparently also serves Lebanese food. The Ollie's here serves soul food along with burgers-- ribs, rib tips, turkey tips, deep fried hams and turkeys, and a bevy of sides. We decided that burgers were the best bet. We each got an Ollieburger and fries. The fries were crispy and seasoned with paprika, some cayenne and celery seed. The burgers had a similarly-flavored sauce (Roadfood mentions that they're based on the same spice mix), onions, Swiss cheese, lettuce and tomato on a soft, cornmeal-dusted bun. The burgers were good-- juicy and messy-- and really inexpensive. It's hard to find a non-fast-food burger that is under $5, but this fits the bill. With fries for both of us, the bill was $13. I can't wait to go back and try some of their barbecue (but I think I'll leave the deep fried ham to someone braver than I-- Terry?)! A few weeks ago, Julie and I were having lunch at Habanero in Clifton when I was reminded of something I’ve believed for a long time: The country’s best cheap eats are often found close to college campuses. This shouldn’t be surprising. College students love to eat out but don’t usually have much money. They don’t usually go for complex or sophisticated fare, but there will always be a market for feeding good food at bargain prices to college kids. Though it has been more years since college than I’d like to admit, I well remember counting out change from my coin jar to finance a Saturday-night burger. Late-night pizza, the cost divvied up among five or six people in the dorm, was a staple back then, as I’m sure it continues to be for college kids today. I attended a marginally accredited, mid-sized state university in a “college town” in the Deep South. And although, even in those days, there were plenty of fast-food chains available, my favorite places were the locally owned mom-and-pop joints. And what’s truly amazing is that most of them are still there. I still visit all of them from time to time, whenever I find myself in that part of the country. One place, I swear, serves the best wings and fried pickles I’ve ever eaten (and after a recent trip there, Julie concurs). Another serves an incredibly flavorful and juicy hamburger with a peppery ketchup-based sauce and the strongest onions I’ve ever eaten. Probably my favorite place had, among other things on an extensive menu, my all-time favorite char-grilled hamburger steak, smothered with a mountain of sautéed onions. Or am I wrong? Is it possible that my long-ago favorites aren’t really all that great…that my taste buds are colored by nostalgia? It’s no matter, I suppose. As a high school teacher, I have a fair amount of free time during the summer months, especially this summer. And as someone who feels a need always to be productive, I’ve decided to undertake a major summer-long project: Lunch. What are your favorite food memories from college? I’d love to hear them. And, especially if you attended college within an hour’s drive or so from Cincinnati, I’d like to know what your favorite food haunts were. Give me the names of the restaurants, along with your favorite dishes at those places, and I hereby pledge to treat myself to lunch at least twice a week for the next two months, investigating and reviewing your recommendations. Please respond soon. I’m hungry. Sunday Dinner: Damn, it's hot. You read me correctly there. Damn, it's hot. It's 90+ in June, with 90+ humidity. It is going to be a long summer. Most Cincinnatians aren't used to this kind of heat until at least July. All I want to do is sit on top of the air conditioning vent and drink lemonade. Okay, I really want gin and tonic. Ugh! We didn't feel like cooking indoors today, so Terry is firing up the charcoal grill and we both made a few things indoors-- all chilled and uncooked. First, cucumber salad-- one of my favorites. Sometimes I do it with bacon grease (which is how my grandma did it), but I wanted something a little bit healthier. This is inspired by Nigella Lawson's recipe, with a few of my own touches. 3-4 medium cucumbers, sliced quite thinly. I used a v-slicer (since Terry doesn't have a food processor); I often use a food processor or just a knife. Very thin, please! You can leave skin on or not; I chose to leave it on. 1/4 cup rice wine vinegar-- it's my favorite white vinegar; I only use the regular white stuff to clean. White balsamic would work, so would white wine vinegar or champagne citrus vinegar or whatever. 1/4 cup (or so) fresh dill, chopped finely. I used more-- more towards 1/2 cup. Toss the very thinly sliced cucumbers into a bowl. Whisk together the vinegar, sugar, and salt and pour over cucumbers. Toss until coated. Sprinkle with fresh dill and toss some more. You can eat this right away, or, for optimum flavor, stick in the fridge for a bit. The salt will draw out a bit of water, but it'll taste better. Trust me. We also made Roquamole, also from Nigella Express. This is awesome (and the reason I wanted something a little lower fat for the salad) and a little different and very rich. I imagine it could be stomachache inducing if misused. It also has approximately one million calories per bowl, so this is something to serve at a party-- in fact, I intend to serve it at my next one. I used Danish blue instead of the Roquefort, and it turned out just fine, thank you. I also threw in some lemon juice to keep the avocado from oxidizing and that helped brighten the flavor. A third dish was some simple shrimp with Terry's homemade cocktail sauce. I don't know why anyone buys it in a jar--all it is is ketchup, horseradish, worcestershire, lemon and Tabasco. Mix it together to taste-- we both like it really horseradish-y. A bit earlier in the day, I braved the sun (and my very hot fire escape) to plant some herbs. It's funny-- I lived in a house with a yard for four years and never really managed to garden. Now I live in an apartment in the middle of a cement jungle and want to grow herbs. Ah, well. I ran over to City Roots and picked up some containers, dirt and herbs. If you know me well, you'll know this is fairly significant, as Julie doesn't like to mess with dirt. Yuck. But I braved the dirt and now have a lovely herb garden planted. I still have some dirt left, so I think I'll swing over there tonight and pick up 2-3 more herb plants. Right now I have lemon thyme, mint, basil, chives, and rosemary as well as two patio tomato plants-- I think I'll grab some dill and some more basil. I love fresh basil. I hope to spend a bunch of time using these lovely herbs this summer. Oooh, looks like Terry has half of his work done for him: The New York Times put out a scorecard for major league ballparks (it's accompanied by an interesting article about ballpark food)! I've only been to two ballparks-- GABP and Shea Stadium-- but I'd definitely agree with the writer's opinion on Skyline being one of the best things there. It's pretty good and pretty indicative of something traditionally Cincinnati. And the nachos ARE pretty bad, but I think the hot dogs are worse. I didn't have anything other than a hot dog at Shea Stadium, but darn was it good. What's your favorite food at an American ballpark? I read the article in the New York Times on recipes and what turns people off from making them. I read a few comments, posted my own, and got to thinking: Is there anything I won't try? I haven't had luck cooking tofu-- I can never get it to taste like anything other than paste-- but is that to say I wouldn't try a recipe if someone sent it to me and said "here, this is the mother of all tofu recipes"? Marla swears that she has some good tofu recipes, and I'll try them. Not really a "dealbreaker". A lot of people said that their "dealbreaker" is odd ingredients-- you know, the spice you need a teaspoon of but rarely use again. Terry often says, "Man, I'd love to make that, but I don't have X," and usually I have it-- I love buying sauces and spices. Another comment that came up on the Ruhlman blog is cook vs. some other designation-- that you have to be willing to do everything to be a cook, otherwise you're just faking it. This reminds me of the Foodie discussion we had here a couple of months ago. So are you a cook? What makes a cook? Is there anything you refuse to touch in a recipe? Don't forget to stop by Cincy Chic's Chic Chef series-- this week is Ameri-French! I won't be able to attend tonight, but I can't wait until next week! I was lucky enough to be invited by MCI's director, Joe Moss, to The Summit Room's preview evening on May 22. In an earlier post I gave you a bit of the background, so let's skip the niceties and get on to the food. We were greeted with glasses of champagne and the first dish of the evening-- a spicy tuna tartare on top of buckwheat noodles. Awesome! What was great about it is they kept the beauty of the dish-- elaborate plating, beautiful presentation-- despite the fact that we were eating one-bite versions of each dish, and they were served on plastic plates. I was very impressed by this. The flavor of the tuna was nicely complimented by the spiciness of the dressing, which came from kochujung, a Korean garlic and pepper paste. On the ice sculpture, they served some antipasto-- cheeses, meats, and a tapenade made of eggplant, sun-dried tomatoes, olives, and the biggest capers I've ever seen. We then moved on to the entrees-- we didn't discover the second courses until after we had entrees, so our experience was slightly out of order. Duck breast with barley, wild mushrooms, red wine and orange was my first and was most impressive. The duck breast held up well in the hotel pans, and the barley and mushrooms were a nice, rich compliment lightened up by the citrus and red wine. The risotto cake held up fairly well, too-- though I think I would prefer this as an appetizer than an entree. It is, however, a lovely vegetarian choice. The next dish, the pork, was my absolute favorite. It involved roasted pork with chipotle and tomatillo sauce, pickled jicama, fried plantain and house-made chipotle ice cream. You get hot and sweet and creamy and cold and sour all in one bite. The chipotle ice cream was surprising-- creamy and sweet, then as it hit the back of your throat warm and spicy. Just awesome. I hope to go back just to get this dish. As warm and rich as the pork was, the Arctic char was creamy and light-tasting. It was served with some jicama as well as mashed chickpeas, saffron cream and some fennel. Delicious. We then discovered the second courses, which were tucked away and a little hidden. They were great and inventive-- I could make a meal out of the arugula and gnocchi, with goat cheese and favas. I don't like favas, generally, but I liked them cold and just barely cooked. The other salad was a composed salad of asparagus, bread, raisin puree, pine nut puree, and parmesan. Beautifully presented, and quite delicious. I loved the sweet and rich raisin puree! The rich, dark brownie with banana, passion fruit puree, and malted ice cream on the side was my favorite. I never thought that banana and passion fruit would go together, but boy, did it. We also had rhubarb tarts with fromage blanc, port, and mint. The rhubarb was cooked in port, and the tart filled with the fromage blanc and topped with the rhubarb. A great use for this seasonal vegetable (which I need to cook with, and soon). The other item in that picture is lemon custard, topped with pistachio, honey and lavender on top of a crisp cookie. This reminded me of tart lemon curd, with a nice contrast of salty pistachio and sweet honey. Wonderful. The Summit Room is an absolute gem. The prices are great-- $7-29-- and the flavors are pretty adventurous for Cincinnati. When Joe and I chatted after dinner, he told me about the lamb-- not featured at this tasting, but it involves encapsulated mango puree. Molecular gastronomy in Cincinnati-- who knew? If you want cutting edge food at a good price that helps future chefs shine, you need to try out The Summit Room.